These figures continue to show a significant drop in footfall compared to last year. While the numbers will be affected by the recent adverse weather they still exceed the national and regional decline in numbers. Dartmouth Business News has avoided addressing this problem in the past but in the spirit of making a positive contribution to the debate lets explore what we could do about this problem with the right level of commitment. Clearly funding will be an issue but there are sources that we have not exploited yet. Sounds straightforward doesn’t it, but due to economic pressures Dartmouth has lost control of its promotional activities. 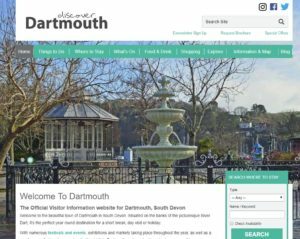 The loss of our website Discover Dartmouth means that there is now no organisation in Dartmouth taking responsibility for a long term marketing strategy to bring more visitors to town. The reasons for handing over our website to Visit Devon were purely financial, but ignored the impact the decision would have on the economy of the town. The annual licence fee of £10,000 for the site was disproportionate and beyond the means of our Visitor Center. The New Minds platform was designed for bigger towns and uses a proprietary CMS (Content Management System). This means that all changes to structure have to be paid for. A better solution, in our opinion, will be to use a general web development environment like WordPress to create a flexible site with no licence fees and the ability to modify locally at low cost. We suggest that the DVC should invest in creating this new site immediately so they can actually offer their subscribers a real marketing service. 20% of the worlds websites are developed in this environment , as indeed is this website you are reading now. This is a simple site that has cost nothing to create, the only fees being the hosting and registration of the site URL. There is no limit to the scale or content of the site you can develop and it would be the perfect choice for Dartmouth’s TIC. 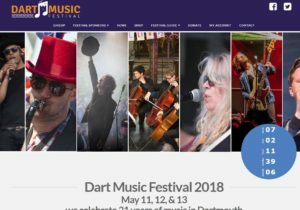 It is not too late to invest a relatively small amount in creating a new Word-press based website for Dartmouth but we must ensure that we apply the right skills to its creation, and develop the right strategy to exploit its potential. Those of you familiar with the music festival website, which is Word-press based, will appreciate the capabilities of this environment, with the added bonus that any site developed in Word-press is automatically responsive, unlike the current site. meaning it works on all digital platforms, PC, tablet and Mobile phone. The original cost for the Music festival site was about £3,000, with minimal maintenance costs. The site is updated every year by an unpaid volunteer so there are no ongoing costs to maintain the site. The website alone though is not enough. It must be backed up with a clear digital marketing strategy aimed at using social media to drive more traffic to the website and ensuring a strong follow up to encourage visitors to come here. Try a local competition to see who can get the most retweets or Facebook shares of positive posts about the town. We need to saturate the web with Dartmouth messages. Finally we need the people who make the decisions, which in my opinion is the Town Council as effective owners and directors of the DVC, to recognise the problem and accept support from townspeople with the skills to help. The old nut that no one has been able to crack (including me). The idea of a second storey on Mayors Avenue car park seems a good idea ( not to the residents of Mayors Avenue I suspect!) but first the community needs to understand that people who want to visit the town want the convenience of being able to park here. Its unpopular with the environmentalists but inevitable if we want our tourist economy to thrive. 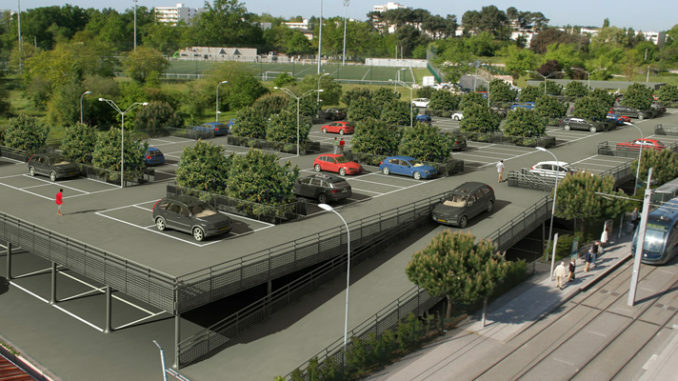 The architects could design a car park that would minimise the visual intrusion (see example). Other alternatives considered in the past include a new car park built on pylons over the river just south of the upper ferry slip, just like the car park in Dart Haven Marina next to the station. This could hold about 250 cars and would occupy an unusable area of the river that requires constant dredging to keep it navigable and indeed dries out at low tides. Build a transport system between the upper and lower town. This we believe would help to unite the town both physically and socially, and it will be essential when the West Dart development finally gets built. Does anyone else think it ironic that SHDC’s objections to the small proportion of affordable homes in the West Dart development has resulted in a delay that has made housing even more scarce in the town. The price escalation in Dartmouth is a function of supply and demand, so surely its important to build any houses just to increase the supply. This will help to keep all prices at a more reasonable level. This is just our view of what we should be doing to help our town thrive. The new round of the Coastal Community fund is offering £24 m to communities like us in England. Surely we qualify for this support. Lets at least get a dialogue going about what positive action we can take to get Dartmouth buzzing again. I don’t want to see Dartmouth become a sleepy retirement haven. It is more than that but it needs action to get there. Give us your views below if you wish. (3) Parking bays on the site of the old Sea Cadet unit at the bottom of College Way, surveyed conducted by the late Cllr Bill Wills discovered 100 cars could be accommodated …cancelled MOD would not release land as it features in there future plans that was 2009 still nothing and site overgrown and unsightly. Hover Rail Link from Townstal to the lower town…cancelled lack of funding. Townstal has the majority of all year round residents, with two major retail stores and two independent retail stores,how do we encourage these residents to visit the lower town when a large percentage of retail operators are specialised retailers, excellent art galleries and designer label retailers all of which are not on the weekly shopping list, sadly we must accept that Dartmouth is longer a market trading town but a day visitor town, second homes though providing employment for many have hit the all year round infrastructure of this beautiful town and again we have to accept that online shopping and banking has had a disastrous effect on the community as from later this year Dartmouth will have no bank branches but will rely on mobile units visiting, local bus company have raised their prices again which will add to the footfall impact. Whatever think tank consortium is set up they will need to look at attractions to bring the all year round population to the lower town, for me since being elected to DTC in 2007 I have been on many committees that have looked at all of this and again we are back to square one, many will not like my closing phrase and will see it as unhelpful but with all honesty that what I feel now..Dartmouth is in a Chicken and Egg scenario. Steve, I hear what you say but it just needs the courage and committment to respond and make difficult decisions. My parking management group ,which lasted 18 months, came up with a proposal that had majority support in the town but the Council lacked the courage to act. Every action will have objectors but the good of the town must prevail. As we explored and were committed to during the life of the BID … embracing the internet and any technologies that extend reach and performance and give customers an excellent service. Marketing is key to any business development and place reputation. I do believe a more collaborative and collective approach where key objectives/issues can be shared and solutions sought. No and no ! Certain influential people put a stop to (1) and the convent did not preclude a car park under the orchard. I was there, it was the Dartmouth Town Councillors that simply did not have the balls…………….